Very rarely, an absolute gem flies under our radar, as seems to be the case with Jagex Games Studio’s Miner Disturbance [App Store]. Based on a PC game by the same name, Miner Disturbance is an alternate take on the classic Dig Dug formula. 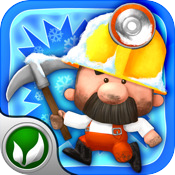 In Miner Disturbance, you take control of a very Mario-esque miner, whose job it is to pick a rather hazardous mountain clean of all its precious metals. Part platformer, part puzzle game, Miner Disturbance has you haphazardly negotiating a series of deteriorating, volcanic, gassy and waterlogged mine-shafts…filled with nasty critters no less. Your miner is directed via a virtual thumbstick and on-screen buttons. One button enables you to dig through rock and the other is your life-saving jump button. Though the controls are simple, Jagex Games Studios (of Runescape fame) have put effort into making your mining life as easy as possible. 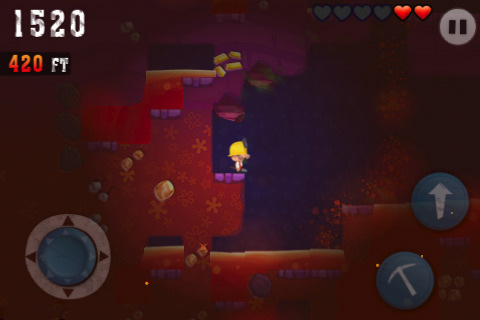 Pressing in a direction while pressing your dig button will stop your miner from tumbling down precarious drops, enabling you to easily pick at rock on the other side of the gap. Once learned this becomes an essential tool, as in order to successfully complete each of the 25 levels’ objectives and achieve a gold rating, you will need to dig yourself an elaborate maze to avoid or negotiate the pitfalls you encounter. These stem from simple water-logged areas, where digging around submerged areas realistically spreads the water, to dangerous lava-filled caverns, or areas where poisonous mushrooms emit a toxic gas when disturbed. Add to this the necessary rats, moles, spiders and bats that naturally inhabit these areas, and you’re never short an obstacle or three. Completing each of the level’s objectives has the added boon of rewarding you with coins, which can be spent upgrading your miner’s abilities. These are essential to reaching the lowest depths and returning alive (the latter a requisite of each and every level) as they improve things such as jumping height, health and water and gas breathing time. Equipment can also assist you to walk over lava, climb sheer rock faces, and locate enemies and artefacts. To complement the core missions, Miner Disturbance uses these artefacts in a meta-game of sorts, displaying the artefact pieces you’ve collected in a museum accessible via your overworld map. A volcano is also unlocked after the inital few missions that is essentially a randomly-generated survival mission that records your highscores to compare with your friends. The volcano is peppered with the same dangers as the standard levels, with the added peril of triggering a volcano if your digging makes the volcano unstable. This commences a mad back-track as you attempt to out-run the forthcoming eruption; some of the best fun to be had with the game. And your results are all recorded in OpenFeint or able to be shared with your friends via Twitter or Facebook. Jagex Game Studios have already released 5 free levels featuring an entirely new arctic world; complete with new icy obstacles to overcome and a new artefact to discover. Even without the added sweetener, Miner Disturbance is a terrific action-packed puzzle platformer that should keep you entertained for hours as you pick your way through devilishly concocted mineshafts. 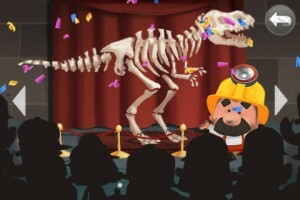 The iOS version also benefits from a faithful but more detailed and glossy re-imagination of the original artwork. For those still on the fence, or if you’re simply interested in sampling the gameplay first, have a go at the free online Java version.